The cuisine from the southernmost island of Italy is full of impressive diversity. The spices and flavor combinations are a result of Greek, Roman, Moor, Byzantine, Islamic, Norman, Catalan, and Spaniard civilizations. From the pistachios grown in the volcanic rich soils of Etna, to the salt flats of the western coast, the endless bounty ranges from the mountains to the sea, contrasted by olive trees as old as the Greek temples, with date palms growing between Moorish minarets and Baroque cathedrals. Sicily's unique wines of indigenous grapes, such as Nero d'Avola, Carricante, Nerello mascalese, and Nerello cappuccio, have grown on the volcanic slopes of Mount Etna since the 5th century BC. Such specialties as chickpea fritters, lemon granita, sword fish with mint, anise biscuits, mozzarella filled arancini, sesame seed studded breads, bitter almond stuffed sweets, and spaghetti with sea urchins, showcase the array of flavors in the Sicilian kitchen. On October 9th we bring you the third and final dinner in our Sapori Regionali : Slow Food Supper Series. which offers a multi sensory experience that will transport you to another place while displaying the global aspects of shared food at the table. 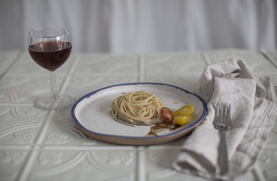 During the meal we will expand upon the Slow Food movement and what it means for global food culture as well as the impact it has on Italian Regional food and wine. Elder Hall invites you to join Jason French of Ned Ludd/Elder Hall and Astrid Ensign of Taste of Italy as they immerse you in the wine and food culture of Regional Italy, highlighting Tuscany, Veneto, and Sicily. Each dinner in the series will group wines from the region and food inspired by the region but sourced and produced in the Pacific NW. Through this series we hope to connect you with Slow Food, the amazing growers and producers in our area and create meaningful cultural connections via culinary experiences.